What Brand is that? -it's Used. The first step in selecting your canoe or kayak is to think about the type of waters you will be on. Will you go on the whitewater rivers? Will you go on lakes and streams? Next is the type of experience you are looking for: Do you want to relax? Do you want to fish? Do you want to tour for several miles? Will you have a partner? Do you want to surf the waves? Once you know the answers to these questions you can begin to evaluate different brands and models. Shorter boats will turn easily and cost less but they'll be difficult to keep going straight, have little capacity or seaworthiness and will require much more effort to keep moving. If you do all types of waters consider getting a little longer boat that has some rocker. This will give you glide and tracking but also maneuverability, capacity, and seaworthiness. A canoe and kayak dealer that is worthy of your valuable time will have several brands and dozens of models to choose from, so set aside a couple of hours for discussion and on-water testing. One important step in selecting a kayak is to sit in it to check for roominess and seat/backrest comfort. This is a VERY relative thing, so be sure to try on several. Minor modifications can be made but your initial feeling about comfort should be positive; if not, don't even try that kayak out in the water. Some kayaks have larger openings or taller backrests that can really make a difference for larger paddlers or those with limited mobility. 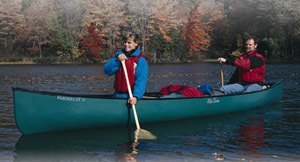 A person's size is much more important when selecting a solo canoe or kayak than when selecting a tandem. 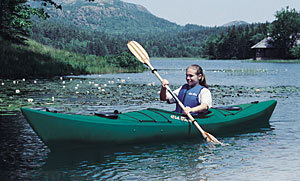 Another factor to consider when selecting a canoe or kayak is the cost. Be wary of the canoe or kayak priced much lower than other brands- there is probably a good reason for it. Generally the cheaper boats are of poor design and low quality; few things will prove to be as long lasting as a quality canoe or kayak. Brands that cost more but don't deliver satisfaction will quickly go out of business while a Brand that has a lower price may be able to survive in spite of poor design and materials thanks to those who are always drawn to the lowest cost option. A poorly designed boat will often have several owners- as it gets traded in or re-sold often when people realize how heavy and tippy it is. it's probably been years since they used it. Those who buy a well designed kayak or canoe that they fit very comfortably in are MUCH more likely to use it frequently. Sometimes the worst thing is owning one that is so entirely mediocre that you don't use it very much but ou don't hate it enough to sell it. Since there are constant improvements in design and technology, used canoes and kayaks are not always as good a value as new ones. Those who own a good canoe or kayak often keep it for many years or even decades since it literally costs nothing to own one after the initial purchase. This means that your selection of quality canoes and kayaks is always much greater for new than used. Our Best selling model from ten years ago may not even be a valid contender given the upgrades to a new model we have today. So remember, when selecting a canoe or kayak, take your time. Try out the boats yourself and see what feels good to you. YOUR review is the one that matters. Don't just go for the cheapest one -go for the one that will take you where you want to go easily and comfortably. Good quality and performance in a canoe or kayak that you fit well in will always prove to be the best bargain. New -an MSO is available only to the original new owner. We can help if you purchased it new from our store (within the past few years). The only reason we need an MSO is to register the craft for use with a Motor. We recommend you buy a new model if you'll need an MSO. Our best advice is to look at reviews and then come in with an open mind. You should do your own review right at our store... sit in it, paddle it, give it a really good look over.